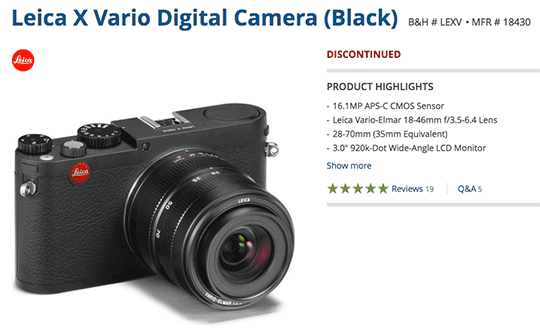 Another one bites the dust: the black Leica X Vario camera is currently listed as discontinued at B&H and Yodobashi. 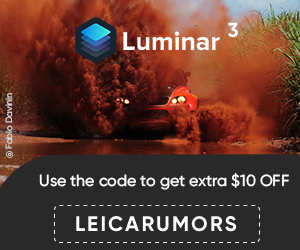 The silver version, which was announced after the black model, is still available and is currently selling almost at a $700 discount from the original price of $2,850 (you may find an even lower price at Amazon). It will be interesting to see if Leica will refresh the X Vario product line at Photokina since this camera has been widely criticized for its slow Vario-Elmar 18-46mm f/3.5-6.4 lens. This entry was posted in Leica X Vario and tagged Photokina 2016, To be discontinued. Bookmark the permalink. Trackbacks are closed, but you can post a comment.